Use our Quick Carrot-Chicken Mole recipe for a tasty take on a Latin American classic. 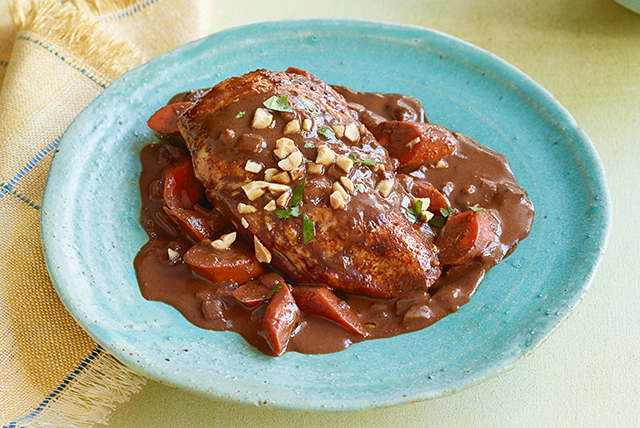 Chocolate and peanut butter makes this chicken mole recipe unique. Mix first 5 ingredients in medium bowl. Heat oil in large skillet on medium-high heat. Add chicken; cook 2 to 3 min. on each side or until browned on both sides. Add onions and garlic; cook 1 min. Add broth mixture; cook on medium heat 15 min., stirring frequently. Meanwhile, cook carrots in boiling water 15 min. or until fork-tender. Drain. Add carrots to mixture in skillet; simmer on low heat 5 min., stirring to coat carrots with sauce. Top with nuts and cilantro just before serving. Mole sauce can be made ahead and kept refrigerated in an airtight container up to 3 days until ready to use. This quick version of mole also tastes great with pork. Bring about 8 cups water to boil. Add carrots; cook 15 min. or until fork-tender. Drain. If not used right away, place them in a bowl of ice water to stop the cooking process. Once cooled, drain.